While listening to the TV news or browsing through the paper, we often come across accident reports most of which are caused by negligence of the driver. At times, even the best of drivers’ falter as they have no clue of what is happening behind them especially while moving their vehicle in the reverse gear. 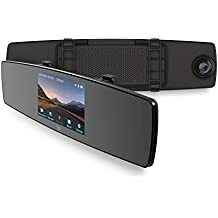 Keeping such things in mind, we are today going to discuss about mirror dash cams which can provide you with a clear front and back view of the road as well as approaching vehicles. Having the right dash cam installed in your vehicle can be of great help in avoiding critical accidents while driving your vehicle or parking the same. It is also possible to document your entire road trip in its built-in storage space so that you can refer to the same whenever required. 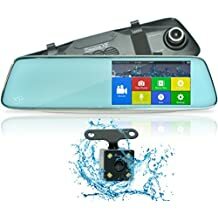 Enough said, let’s now take a look at ten of the best mirror dash cams available in the market as well as a buying guide for helping you in taking a well-informed decision. Resolution serves as one of the primary factors which needs to be taken into consideration while purchasing a mirror dash cam as there is no point in recoding footages if you cannot make out anything out of it. You should never settle for anything below 720p as this is the bare minimum resolution which is required for making out license plates, faces and car models. Loop recording is another such feature which can help in preserving the memory space of your dash cam by overwriting the oldest footages with the newest ones. This attribute ensures that your camera never runs out of memory and keeps on recording indefinitely. While travelling at night, it becomes essential to have the backing of a night vision dash cam so that you can rely on the illumination provided by your camera even if the street lights go off. Some other features which can add to the versatility of your dash cam are motion detector, G-sensor and auto on/off. However, it is imperative to note here that such features might cause the price of your dash cam to rise substantially. But when it comes to road safety, it is impossible to measure it with a specific price tag. 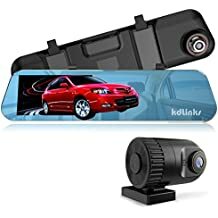 High quality IPS screen and premium build quality has helped the R100 mirror dash cam from KDLINKA in curving out a niche for itself amongst driving enthusiasts around the globe. You can find a 16GB microSD card, some literature and the required connectivity cables in the box to get you started almost instantaneously. Although the included storage can cater to your shorter recordings, it is recommended to opt for a bigger one since the full-HD video clippings of the R100 can eat up its storage space pretty fast. Coming to its design aspect, the R100 looks more like a rear-view mirror. The front mirror houses a few navigation buttons and is covered with mirrored glass panel through most of its circumference. Connectivity and ports have been kept relatively simple for nailing an unobtrusive look which can blend in seamlessly with your car interior. The Auto-Off feature is another unique addition which shuts down the dash cam automatically when your car engine is turned off. Some other features which deserve special mention are Accident Auto Detection, built-in G-Sensor and emergency video lock button. Stellar customer care team which can cater to all your worries. 800mah battery can keep your mirror dash cam running for long without the requirement of any external power source. Premium IPS screen is comparatively better than its TN screen contemporaries. Can render support to both 64 and 128GB card for better storage. Unique auto-off feature to help with power savings. Rear camera is not weatherproof and thus cannot work outside the car. The Pruveeo D700 offers a waterproof rear camera option so that you can be tension free while using the same during rainy season. It can capture videos at the stellar resolution of 1080p Full HD so that you can make out everything from number plates to road obstructions with utmost clarity. 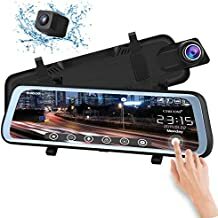 This mirror dash camera can also come to your rescue if you wish to record the footage of an accident scene for future evidence. 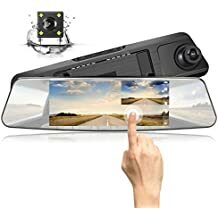 Its rear view 90-degree angle lens can also capture 480p videos so that you can focus on the road ahead as a layer of protection buffers you from accidents. Even top-notch drivers face difficulty while parking their car as they can hardly make out what lies behind. This also leads to various crashes and accidents. Keeping such things in mind, the manufacturers of Pruveeo D700 have included a special parking mode which shows the parking image in full view when the reverse gear is engaged. Installing the mirror cam is also an extremely easy affair as you just need to fit it over your existing rear view mirror followed by installation of the cable inside the car cabin and plugging it into the cigarette lighter. It is advisable to use either SanDisk High Endurance Micro SD Card or Samsung EVO for making the most out of this stellar mirror dash cam. You can either opt for picture-in-picture display or footage from a single camera for being viewed in the 7” touch screen. Weatherproof rear cam to keep your back at all times. Parking image gets displayed automatically without having to press any button once the vehicle starts moving in reverse gear. Built-in battery is not of much help. The Y1 mirror dash cam has been specially designed to ensure that it can be mounted easily following which it stays in its place while you drive around the town. It also does not require any professional help during the installation drive. You just need to mount it over the original rear-view mirror coupled with its adjustable elastic straps. The emergency recording gets activated automatically by the built-in 3 axis adjustable G-sensor in the event of collision for protecting the entire footage inclusive of the moments leading up to the mishap for future reference. Reverse motion can also be seamlessly detected by its simple auxiliary line setup of the 720p camera which fits discreetly into your car’s rear. 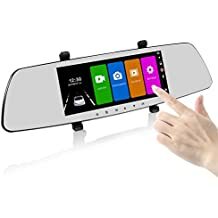 You can thus switch your mirror display for having a closer look at what is being recorded by the rear camera having an IP67 dustproof and rainproof rating. The accompanying Y1 Dash application can be installed in your smartphone for viewing videos as well as browsing through playback history on a real-time basis. You can even share these videos with your friends and family through its built-in 2.4GHz wireless module. The driver fatigue feature stands out as another interesting aspect of this versatile dash cam which sends a prompt every two hours for checking your level of alertness while on the road. 138° all-glassfront facing camera lens with f/2.0 aperture for ensuring wide coverage in high resolution. Infrared filter on four full-glass lenses deliver clear optical capabilities during both day and night. Built-in Wi-Fi to help with the usage of its accompanying application. Mirror lacks any dimming option. It is now possible to get the best footage during both day and night coupled with the versatile mirror dash cam from TOGUARD featuring a 1080P front camera and 480P waterproof rear camera. You can also view video laterally coupled with its 7 inch IPS touchscreen which has been accredited for providing a wide visual angle. On connecting the red wire of the rear camera with the power positive wire of backup light, the rear camera image along with 4pcs of night vision lights will switch over automatically to full view mode. Once the reverse gear gets engaged, the parking guide line is displayed by the mirror dash cam to help you with parking in tight spots having insufficient lighting. Both the rear and front cam get switched on automatically and enters the recording mode when you try to park your car. On detecting collision, the integrated G-sensor shall auto-lock all recorded videos. 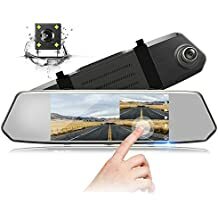 Coupled with such stellar attributes, the mirror dash cam can serve as your ultimate ally which can guarantee you complete peace of mind while out on the road. It also becomes extremely convenient to toggle between the five different view modes with its one-key switching design. You can also use it as a regular rear view mirror by turning off the screen display. In stark contrast to traditional physical buttons, it is easier to set up the concise 7-inch sensitive touchscreen. Features a 2.5D advanced anti-glare mirror. Exquisite screen edge design paves the path for clearer and more seamless viewing in comparison to traditional mirror dash cams. Easy to navigate interface coupled with a multi-function menu. Software causes changes in the aspect ratio. 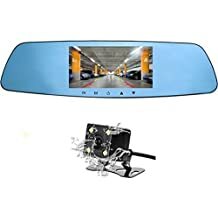 Add some additional visibility to your vehicle with this versatile mirror dash cam from TOGUARD which has been crafted by keeping in mind that accidents do not happen with a warning. You can however keep yourself safe from the hefty insurance and lawsuit claims coupled with the correct footage of the incident which gets recorded automatically by its Gravity-sensor in the event of any emergency or collision. The footage stays locked in the “SOS File” for preventing the same from getting overwritten. Its intuitive touch screen allows you to switch between the four different view modes. It is also possible to use it as a regular rear view mirror by turning on the screen save function. A 32GB Class 10 memory card is recommended for recording all the roadside as well as car interior footages. You also don’t need to worry about storage space crisis as the seamless loop recording overwrites the oldest footage with the newest one once the memory card gets filled up to a particular capacity. The 170° front and 140° rear mirror can capture all the clippings with a stellar resolution of 1280x720P and 640x480P respectively so that you never miss out on the minor details. Its parking assist feature can be of great help when you are trying to park your vehicle into tight spots or moving in reverse under limited visibility conditions. The mirror dash cam switches to reversing mode along with a full view of the parking guide line on the engagement of the R gear. Installing and setting up the mirror dash cam is an extremely easy affair as you just need to tie the RED wire into your backup lights. Comes with an 18ft extension cable for the rear camera. One-touch switch design to bring in more user friendliness. Front and rear cams offer excellent coverage while ensuring best footage. SD card has to be purchased separately. You can become a better driver coupled with the CreativeXP Dual Car camera featuring a low light CMOS sensor especially for scenarios with insufficient lighting. You can thus be guaranteed of recording some super clear footage during your night time drive down the country roads or even under street light. All the files get locked in whenever any collision appears so that you can save yourself from having to pay hefty penalties. Loop recording mechanism ensures that you never run out of storage space as the innovative 3-AXIS G-SENSOR clicks all the requisite footage if you ever face any roadside mishap. Both the front and rear dash cams are accompanied with a waterproof 140° back up camera which can cater to your needs if the primary one malfunctions. The smart sensor detection automatically records any movement from a 13 feet distance while your car is parked and the auto parking assistance feature can intimate you about approaching obstacles while you try to park your car. 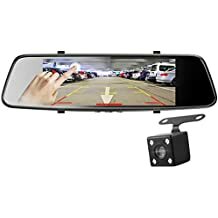 You can easily mount this mirror cam over your current one coupled with the included rubber grips or replace your rearview mirror. For ensuring top-notch quality of videos, it is recommended to use a 32GB MicroSD card belonging to class 10 or higher. Rear camera can also be used as an interior camera for recording footages seamlessly within the car. Sony Night Vision is incorporated in its front camera so that you can capture stellar footages irrespective of the ambient lighting without having to alter the settings. Supports Full HD video quality so that you can clearly make out the number plates of the approaching cars. Touch screen turns off automatically after 1 minute to usher in power savings. Instruction manual might not be of much help. You can be guaranteed about recording all the important footage from the accident spot coupled with the auto-lock recording feature of the SENDOW mirror dash camera. Whenever a collision is detected by its integrated G-sensor, the footage gets recorded before it can be overwritten even when operating under the loop recording mode. While trying to park your vehicle, the camera will come to life and initiate recording so that the files get marked and locked automatically for safekeeping just as the impact gets detected. 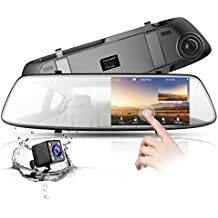 It is also extremely easy to mount the car camera in an inconspicuous manner on the rearview mirror where it won’t cause any hindrance to your line of sight. Coupled with a IP65 waterproof ranking, this dash cam can also be used during monsoon seasons without having to worry about the same getting lackluster. The wide angled lenses of both its front and rear view cameras ensure that you get to see the complete picture of vehicles approaching from behind as well as the road ahead. Connecting the red wire with the positive of reverse light shall cause an auto switch over from the full view while triggering a guide line to aid with safe parking when the R gear is engaged. Back up camera works seamlessly once you get it wired. Large and responsive touch screen for viewing footages and navigating through menus. Simultaneous loop recording supported by both front and rear facing cameras. Wider viewing area provided than any stock mirror. Features several viewing modes such as front, rear, pip and split. Wiring for rear camera is not long enough. Supporting instruction manual is not up to the mark. Now it gets easy to capture road videos and clippings in a crystal-clear manner coupled with the versatile mirror dash cam from Cinlitek. The 16 feet long waterproof and adjustable rear camera comes with Parking Assist feature which reveals the parking image in full view automatically without having to press any button while the R gear is engaged. Both its 110° rear facing camera and 170° front facing camera can shoot with the maximum resolution of 848x480P and 1920x1080p respectively to provide you with crystal clear footage of the road ahead. Coupled with such attributes, the Cinlitek dash cam has evolved into an absolute favorite of people who wish to guarantee optimum protection for themselves as well as their loved ones while out in the road. You can either view the footage from one single camera or opt for a picture-in picture display collated from the simultaneous recordings of both the cameras in its large mirror display screen. It also becomes pretty easy to toggle between the two modes with its simple one-touch switch design. A crash is sensed automatically by the G sensor data protection which thereby saves the file immediately so that it does not get corrupted or overwritten. When your car is parked, the Parking mode gets switched on automatically whereby the dash cam records whenever it detects motion. However, a robust battery source is required for the HD mirror car dash cam to unleash its fullest potential. Blue anti-glare coating eliminates lens glare. Comes with a year’s warranty to cover any issues which may arise. Supports seamless loop recording whereby oldest footage is overwritten with the newest one. Integrated G sensor to detect vehicle collision for recording footages immediately. Driving at night gets easier with the CHICOM dash cam featuring F2.0 6-glass lens which accentuates the image clarity especially while reversing your vehicle. The high-end CMOS sensor ensures that you get a clear picture by preventing overexposure of videos. You can benefit heavily by saving the SD card storage space coupled with its time lapse mode. This is especially helpful when your car has been parked at the same place for days. However, the dash cam has to be hooked up with your car’s fuse box using a hard wire kit for availing the time interval mode. New recordings automatically overwrite the oldest ones with the loop recording feature. This keeps locked video safe and proves to be helpful especially when the memory card becomes full. The rear-view camera automatically gets powered on while shifting into reverse gear to provide you with 140-degree of viewing flexibility. This in turn ensures that you get an adequate view of what’s lying behind your car thus minimising chances of collisions and accidents. You can easily toggle between the rear and front cameras by swiping right and left on the screen while the angle of both the cameras can be switched by sliding up and down. Coupled with an IP67 waterproof rating, the backup camera can keep on recording footages even in rainy weather. Device shuts down within 5 seconds if it is unable to establish connection with the external power supply. Device turns on automatically on detecting collision to record 30 seconds long locked video files. Rear-view camera has an extra wide viewing angle of 140 degree which helps in improving traffic safety to a great extent. Loop recording function makes it redundant to invest in expensive memory cards. Front camera records crystal clear images at 1080P irrespective of the surrounding light. The Jeemak mirror dash cam can serve as your ideal driving companion coupled with its aesthetic interface and top-notch features which can enhance your road safety level substantially. Advanced IPS technology renders a wide viewing angle to this dash cam so that you can clearly preview the road irrespective of viewing the screen from the side or the front. The one-touch switch design of its sensitive IPS screen makes it extremely easy to toggle between modes. This proves to be exceptionally helpful while driving through a congested street where even the slightest diversion in attention can lead to major road mishaps. Loop recording function keeps on overwriting old recordings for storing new ones whenever the memory card becomes full, However, it keeps the files locked by G-sensor safe so that you never lose those sensitive footages triggered by collision. The rear cam automatically switches over to full screen mode while reversing. Its backup camera can also be of great assistance in previewing objects lying behind coupled with the adjustable rear view camera. The motion detection functionality automatically captures a 10 seconds’ video on detecting any motion ahead of the car. This thin device can be easily strapped to the factory mirror using a rubber strap. Its 6 layers of adjustable lens ushers in greater image clarity in stark contrast to plastic lens while the advanced 2.5D glass design renders a premium appeal to the same. Features a one-touch switch design ranking high in the department of user-friendliness. Crystal clear image quality guaranteed by 7” IPS touch screen. Front screen can even be used as a normal mirror by turning off the screen display. Rear camera switches over automatically to full screen mode when the car is reversing. 6-layer glass lens of the CE36 vehicle recorder imparts greater color saturation over plastic lens. The front and rear cam resolution does not synchronize during recording. Modern day vehicles are coming stacked with advanced features which are functioning with the sole aim of bringing along improvements to your driving experience. GPS and built-in reverse cameras are thus becoming a must-have feature of all the latest cars. But these features might not be present in your old model and can thus be separately added in the form of a mirror dash cam. With an array of mirror dash cams available in the market, taking the final call might prove to be pretty difficult for you. However, all your queries are bound to get sorted once you go through our buying guide and recommendations which can help you in taking the best step forward.